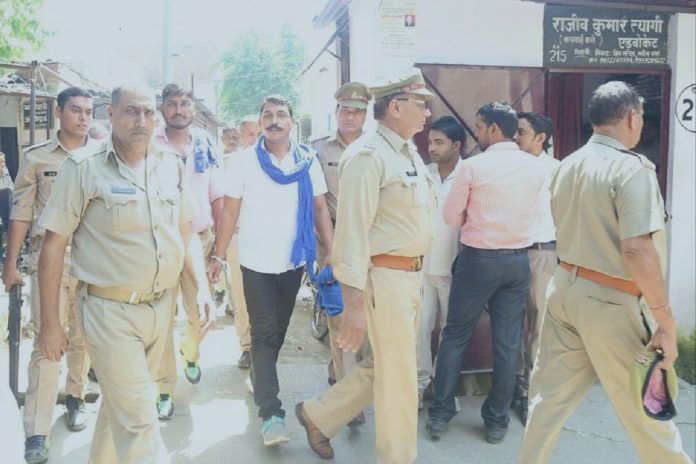 New Delhi: The Uttar Pradesh government released Bhim Army chief Chandrashekhar Azad Ravan, who was booked last year under the National Security Act, in the early hours of Friday. After spending 15 months in the Saharanpur jail, as he walked out with a copy of the Indian Constitution in his hand, Azad vowed to defeat the Bharatiya Janata Party (BJP). “I won’t contest election but will work for defeating the BJP. None of our men will vote for the BJP. Bhim Army will keep fighting until discrimination and atrocity ends in the society,” Azad said. Azad, who may now be courted by several political leaders across the spectrum, has expressed his intention of campaigning for the Grand Alliance in the upcoming national elections. Azad’s animosity with the ruling party in Uttar Pradesh goes back to May last year when 25 police cases were registered against him under different acts of criminal law for infusing communal tension, riots and damaging public property. An advocate by profession, the 31-year-old hit the headlines last year when he organised a protest against atrocities on Dalits in Saharanpur under the banner of his Dalit organisation, Bhim Army, on 9 May. The protest turned into a full-fledged clash between the police and the Bhim Army, resulting in huge damage to public property. A number of buses and other vehicles were burnt and people on the streets were beaten up by the protesters. “This was a well-planned move by the police to defame us. Those who took to violence were not our people, these were the men planted by the police to vilify Bhim Army,” Azad had told this correspondent from an undisclosed location last year just before going to jail. Since the protest, Azad and his Bhim Army have become a household name in western UP, which has a significant Dalit population and often sees clashes between the community and Rajputs. Azad is seen as the new champion of Dalits who fights against the injustice and oppression faced by the community. Several online pages have been created in the names of Azad and Bhim Army even as he has amassed a huge fan following among young Dalit boys. Azad, a native of Saharanpur district, completed his law and wanted to go abroad to study business. But family circumstances didn’t permit him to do so. His father Goverdhan Das was a headmaster in a government school and had a long history of facing humiliation at the hands of upper caste teachers, claimed Azad. This family situation pushed Azad to work for Dalits. He even adopted the nickname ‘Ravan’ who “fought for the honour of his sister”. “I am fighting for the honour of thousands of sisters especially from the Dalit community. That’s why I have taken this name,” Azad said. During his law education, Azad came in touch with Vinay Ratan Singh, another Dalit youth who used to run a computer shop in Saharanpur. “I was preparing for a bank job when I met Azad,” Singh, who later became Bhim Army co-founder and national president, said last year. “We were educated because of our family background (Vinay’s father in is UP Police). But there are many who don’t go to school,” said Singh. Together, the two started a number of schools — Bhim Pathshala — for nearby Dalit catchments and villages. The two were joined by few more youth who started teaching kids in villages. “It is a free teaching system where some of the upper caste children also come to study,” added Singh. Triggered by an incident in Gharkoli village of Saharanpur, the organisation was formed in 2015. One of the Dalit boys from the organisation put up a board outside his house saying ‘The Great Chamar, Village Gharkoli’. The board didn’t go down well with the Rajputs who reportedly form 20% of the 1,500-people village, the remaining being Dalits. One night the board was removed and a statue of Dalit icon B.R. Ambedkar was painted black, leading to an immediate conflict between the Dalits and Rajputs. On 21 July, 2015, Azad and Singh, along with other friends, formed the Bhim Army. “An army’s job is to protect the citizens. That’s why we included this in our name as we swore to protect the honour of Dalits,” said Singh. Since then, the organisation has grown manifold with presence across 40 districts of Uttar Pradesh. Its leaders go to villages to meet people, sensitise them towards Dalit rights and encourage them for education. Their efforts have yielded results visible around the Saharanpur district. Every Dalit catchment has a Ravidas temple and an Ambedkar statue, with Neela Salam and Jai Bhim being the greeting. From Buddh Bhim washing detergent to Bhim Masala, a packet of dry spices, the army members produce everything for the consumption of the Dalit community in Saharanpur. They even organise Bhim Jagran on the line of Mata Jagran. “Dalits account for 40 per cent population of the country. If we start selling our products to our people, we would not have to look outside for economic progress,” said Azad. The Bhim Army has made its presence felt through these initiatives and has often entered into a conflict with the upper castes. “Whenever there is atrocity on Dalits by upper castes or humiliation of our temples, Bhim Army reaches there before police. There have been times where we even controlled the situation,” claimed Azad. In an interview to ThePrint from jail in February, Azad spoke about the “23” cases against him. He claimed that he got bail in almost all of these cases. “On 31 October, I got bail in few cases from the Allahabad High Court and I would have been released from the jail very soon. But in two days on 2 November, they imposed the NSA on me just to keep me in jail,” Azad said.